Last Wednesday evening, I had a thought. 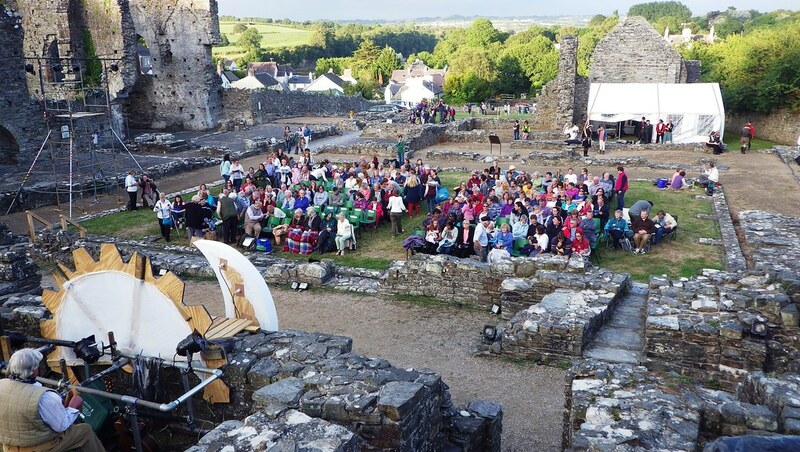 I was stood in the magical grounds of St. Dogmaels Abbey (which I waxed lyrical about a few days ago in this blog post) and thought; I wonder who first had the thought “this would be a good place to put on a play”. By good, I mean fantastic. Looking at the place, there’s an unrivaled, expansive ‘natural’ raised stage area and a perfectly proportioned cloisters garden to act as the stalls for an audience. Later that evening, I got speaking to a chap who I’d not met before – but had seen act (very well indeed) in all the prior 4 Shakespeare annual productions my family and I had seen at the abbey. That chap happened to be Ian Wood. Somewhere around the winter of 1973 (the year I was born, I told him) somewhere around a tucked away pub in St. Dogmaels called The Ferry, and somewhere near another founder of ‘The Players’, Clive Burgess, he had the Eureka moment. He was the one who first thought it would be a good idea to put plays on in the abbey ruins. The rest, as they say, is history. He had a bunch of theatrical connections at Corpus Christi College Oxford and the vision to do something about it. 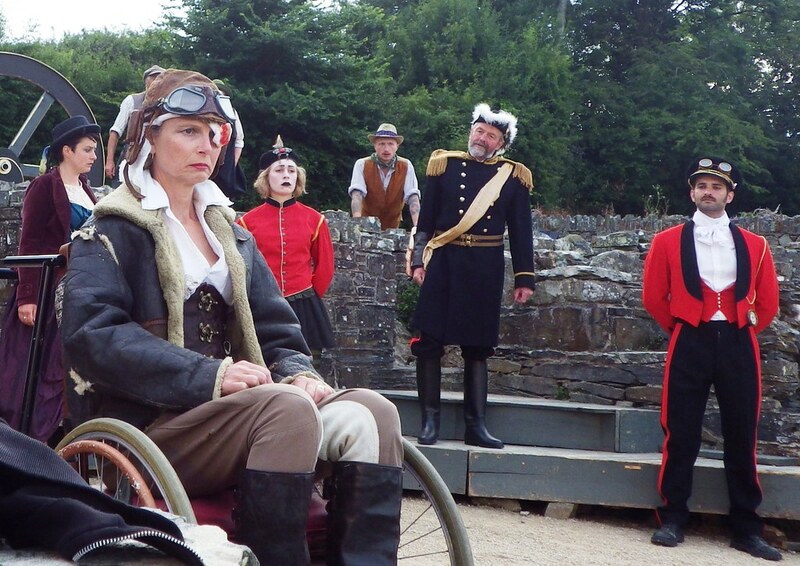 Fast forward a few years, and a company was formed – The Abbey Shakespeare Players. 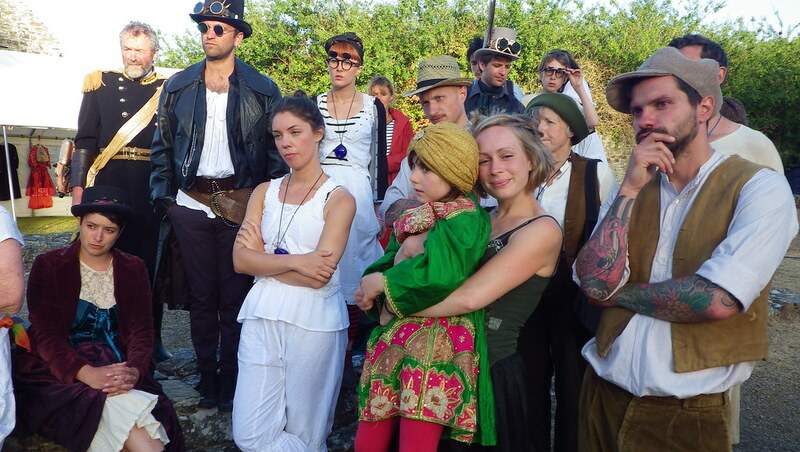 Over the last 26 years, The Company has, without fail every summer, produced and performed a Shakespeare play at The Abbey. 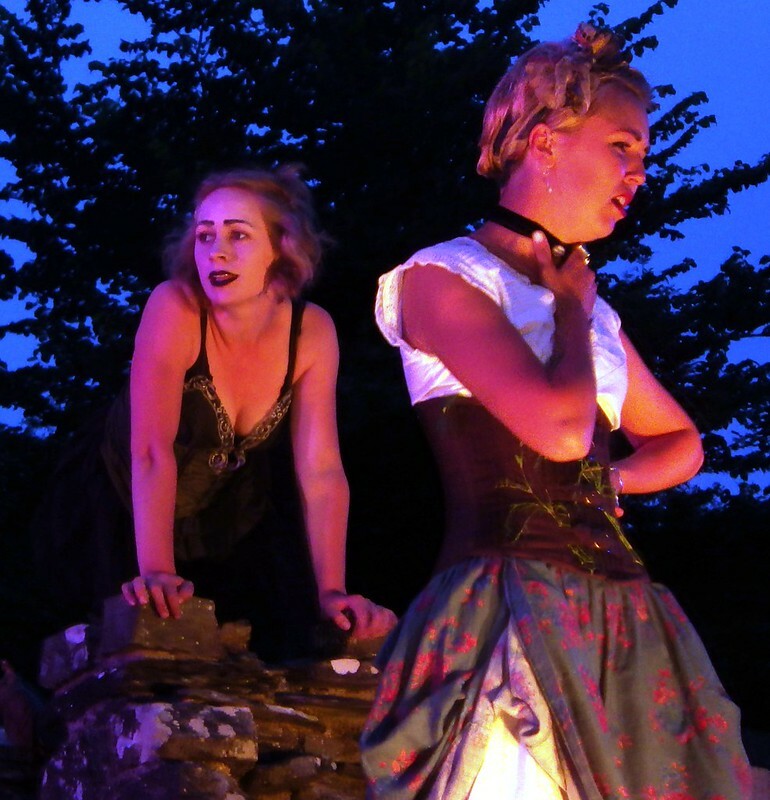 This years play was A Mid-Summer Night’s Dream. This is now The Company’s most popular show as it’s now been chosen 4 times. As a first time viewer of the show, I can see why. It’s got it all – myth and magic, spells and potions, love and heartache and a donkey called Bottom. 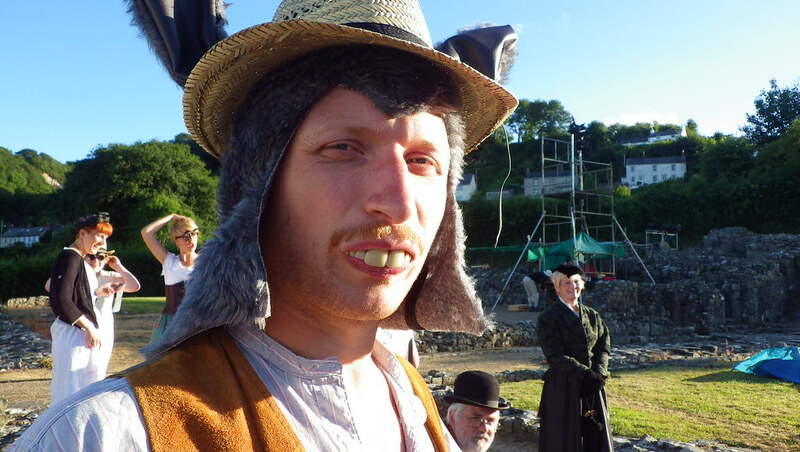 The Donkey called Bottom was played by Henry Morris, yes the 100+ mile ultra race running, Mastermind contestant and director of last years brilliant ‘As You Like It‘ Henry Morris. This year, he acted as assistant director, taking care of the multi faceted ‘mechanicals’ scenes. As well as Bottom the donkey, his part plays two other characters – Nick Bottom and Pyramus, equating to the most lines in the play. I believe it was his biggest ever acting part – he’s been involved, like a lot of the 20 – 30 somethings since he was a wee snip of a bairn. Suffice to say, he stepped up to the plate. Like many names on the cast list there’s more than one of them. Henry’s father Richard Morris, once again composed a breathtaking score for the play, including a truly tear jerkingly awesome grand finale piece as sung in multipart harmony by most of the cast. Hair standing up on the back of one’s neck good. The other long standing Morris would be Henry’s mother Jane Morris. She took a pivotal role this year – as Peter Quince – The mechanicals forman, but perhaps less obviously, as the cast’s ‘mother hen’. I’ve thought of the cast and crew as The Abbey Family more so this year, and Jane’s cottage was a hub of the off stage, the down time and home for the week to what seemed like so many of the cast. A tea pot, always on the go as people popped in for a slice of home comforts and (in our case) somewhere to do the washing up. At one point, Jane imparted some almost zen esque wisdom to my daughter (I was ear-wigging) about what “The Company” means. Along the lines of; Everyone in The Company is very important – whether you’ve got no lines, or the most lines. From the smallest part to the lead parts. Everyone who is in the company is as important as everyone else. If one part of the company doesn’t try their hardest, it lets the whole company down. Sophie, my daughter and player of “The Little Indian Boy” got it. She loved having a pivotal role. A perfect bit of casting. She got to be immensely important but without the pressure of having a speaking part. It suited her down to the ground. That wasn’t the only bit of inspired casting from what I saw. Angharad Evans who played Helena has proved herself to be a master of illustrating the emotive, internal conflict part excellently. Her bitter, close to tears anger is so utterly real and heartfelt. Ian Wood dominated the stage with his Theseus, Duke of Athens whilst Mary Glynn’s Puck was impish, cheeky and lithe, like he should be. One of the surprise stars of the show though – and some rather brave casting, considering he’d never done any acting before, was Tim Buck’s Francis Flute the bellows-mender. Tim possibly had to work harder than anyone else on this, not only because of the part’s significance, but also because he had to learn all the arts of stagecraft required, from scratch. I’m assuming the much talked about workshops by Abbey Wright in the first week helped, because as far as using the whole body to act went, it seemed that a lot of people had picked up their game. Tim got the biggest laughs in the whole show, of which there were many – in all the right places, you’ll be glad to hear – including some proper, genuinely belly laughs from some of the younger members of the audience, which when performing a comedy, must be one of the most rewarding sounds in the world. Consummate performances also from Gemma Streat, who played the fiery Hermia and her love Lysander who was played with compassion and romantic flare by Philip Murray Warson. The Long brothers Will and Ed again were cast big roles this year – and rightly so – their experience and skill once again proved second to none. Hats off also, to the excellent captaincy from Georgina Ferry who’s Direction steered the good ship midnight round the cape of good comedy. No mean feat, when you consider the size of the cast, the complexities of the stage, and the play itself and just under half of which is done at night, all done under an open sky, when given the often fast paced unpredictable micro-climate that’s known around the area, anything could have happened. Thankfully, the weather was extremely kind to us this year – only 1 brief shower and beautiful evenings, most of the rest of the time. 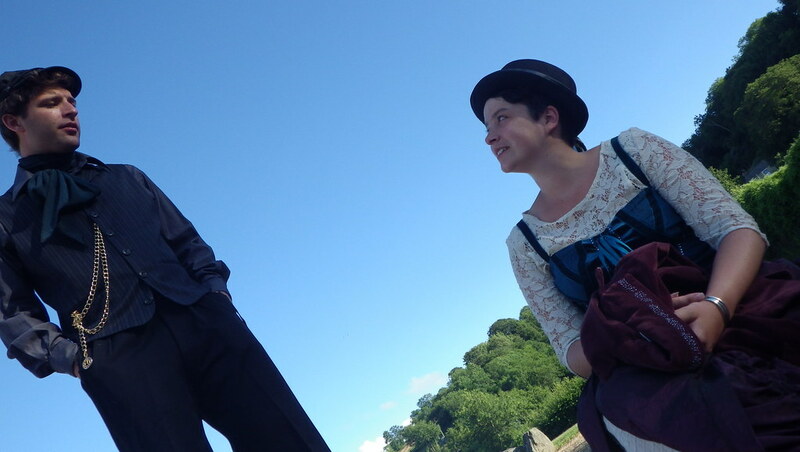 The styling of the play was themed “Steam Punk”. Before the costumes were revealed, this descriptor raised a few skeptical eyebrows, but I think the end result was a winner. When I was asked what that meant (by a visiting prospective bum on seat) I stumbled through an answer that looking back, I was quite happy with – I said something along the lines of “Victoriana meets Colonial Militaria, with a bit of 70s TV Sci-Fi and a bit of East End Wide Boy / West End dandy thrown in for good measure.” Occasionally, all at the same time. I wonder if the costume influenced character at all. I guess it did. All in all, a stunning performance. It’s evident that everyone involved puts in so much energy to the company, and as a result, get so much out of it. The core 20 or so players, give up two weeks every year -unpaid – to put on the play and spend countless hours before hand preparing, and of course learning their lines. This passion and dedication is directly translated onto the stage and into the end product. The play is now in it’s third generation of players. The younglings are looking up to the village elders, and the village elders are passing on years of wit and wisdom. This nurturing of the next generation is further testimony to how important the play is to all involved. There’s a strong hope and desire that it will go on for years to come. Now the question on everyone’s lips – what is next years play and who will be Directing it? I’m going to keep asking that questions until I find out! Perhaps (I can but hope) someone will drop a comment on the very blog post with a hint or a clue. I seem to remember vocalising that I myself might like to be considered for a part in the play next year. Eek. Watch this space. Good blogging. But it already seems so far away. Like a dream: ‘I have had a most rare vision’! Loving your photos Matt ! What devices did you take ? (am sure I read a post about it once but can`t locate). Really enjoying the blog. @Henry I think you should ask Peter Quince to write a ballad of said dream. @Gemma – I hope so to! @Andrew F – These shots were all taken with a Pentax Optio WG-2. It’s a very versatile camera – not the best optics in the world, but I’m quite happy with most of the results, and it’s a great camera for ‘every’ situation. I also took a LOMO LC-A (the films are currently being developed as I type.. watchin this space!) Glad you are enjoying my blog!